Healthy eating plays a major role in our overall well-being, no matter our age. 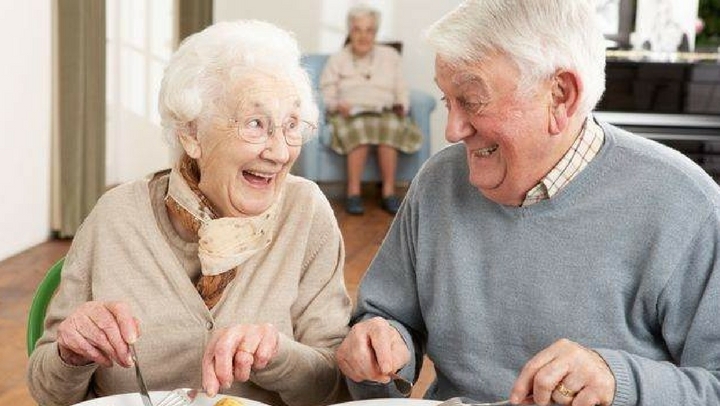 As we age, ensuring proper intake of nutritious and healthy food becomes vital. With passing age, metabolism slows down, immunity reduces, strength diminishes and you are more likely to develop malnutrition as well as chronic diseases. However, these limitations pertaining to old age can be cured to an immense extent by curating a smart, healthy and appropriate food plan. Hydration therapy – Drinking plenty of fluids ensures that you stay hydrated. With progressive age, thirst diminishes and to keep yourself hydrated despite the reduced thirst, include into your day fat-free milk, 100% fresh juice, tea, soup or water rich fruits and vegetables. Planning is the key – Plan your meals beforehand to eliminate the chance of missing a meal. Make a calculated meal plan for the entire week and keep it frozen, until you are ready to use it. Let go of your sweet tooth – Sugary treats consist of refined sugar – which has no nutritional value. Satisfy your craving for sweet foods by substituting sugary treats with naturally sweet foods such as fruits and yams. Read, read & read some more! – While shopping for canned and packaged goods, make sure to read the nutritional values on the label. It may read “healthy” in bold but looking into the fine print, you will realize that it is loaded with sodium, added fat and sugar. Say “Na” to NaCl – Adding table salt to increase flavor is detrimental to the older generation. Because of the deprived taste, older people tend to add salt to already flavored food. By doing this, they are exposed to the threat of high-blood pressure which can cause stroke, heart and kidney diseases as well. Spice and herb it up! – To add flavor to your food, try using fresh spices and herbs in place of salt. Basil, turmeric, cayenne pepper, rosemary and sage are choices filled with flavor! Size matters – Seek help from your doctor to know more about the recommended serving size for you, in order to maintain a healthy weight. Supplements- Apart from fruits and vegetables packed with nutritional value, you should consider discussing with your doctor about additional supplements that can be taken to warrant your complete wellbeing. Friendly Fats- Choose food those are high in monounsaturated and polyunsaturated fats. These fats help in safeguarding the body against diseases and also aid in mood and mental welfare. Variety is always good! – Including a variety of foods into your diet will certify that you get all the nutrients required for a healthy living. Add portions of fruits, vegetables, lean protein, low-fat dairy products and whole grains into your diet as recommended by the National Council of Aging. Include fiber – Eating fiber rich foods is advantageous as it assists in maintaining healthy cholesterol levels, avoids constipation and other digestive problems and helps in maintaining a healthy digestive tract. Fruits, vegetables, beans, lentils, nuts, seeds, whole grains and oats are foods rich in fiber.